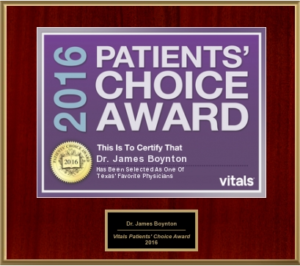 Our team is pleased to announce that board-certified plastic surgeon James F. Boynton, MD is a recent recipient of the prestigious Vitals Patients’ Choice Award for 2016! To earn this esteemed recognition, physicians must receive near perfect ratings across an assortment of care-based components on Vitals.com—a highly trusted online resource that helps individuals seeking medical treatment connect with leading doctors in the United States. Aspects of care in which physicians are graded by their own patients include face-time and communication, bedside manner, extent of follow-up, and more. Out of all the country’s doctors, only 7% were eligible for this honor based on their Vitals.com ratings in the 2016 calendar year. Dr. Boynton is truly humbled to have received the Vitals Patients’ Choice Award, and he would like to extend his gratitude to all of our patients who went out of their way to provide feedback about their experience at our practice. Throughout 2017 and beyond, he says he is committed to maintaining the high level of care each and every individual deserves. If you are considering any form of aesthetic enhancement—whether it’s a surgical procedure like mastopexy or a non-surgical treatment such as BOTOX® Cosmetic—we encourage you to contact Boynton Plastic Surgery today. Dr. Boynton will be happy to help you address your cosmetic concerns and achieve the look you desire.